KIEV, Ukraine -- Vitaly Klitschko stands two meters tall and punches so hard they call him "Dr. Ironfist." Vitaly Klitschko - "Dr. Ironfist." Now the World Boxing Council's reigning heavyweight champion is fighting a new battle, Ukraine's parliamentary elections. On Sunday, Ukrainians vote for an entirely new 450-member parliament. Klitschko has come back from Germany to run for parliament, and to pull this massive nation of 44 million people toward Europe. "We are fighting for what is right," he told a rally audience in Kiev on Thursday night. "We are fighting for ideas - and they are fighting for money. And that is why I'm confident that we can build a normal state. The Poles, Czechs, Hungarians and the Georgians could do it. We are Ukrainians, and we can do it too." Klitschko campaigns against the corruption that many people believe has hobbled Ukraine's growth since it gained independence 21 years ago. Kazakhstan, with barely one-third of Ukraine's population, now has a bigger economy. Klitschko adds "punch" Klitschko's party is called UDAR, Ukrainian for punch. 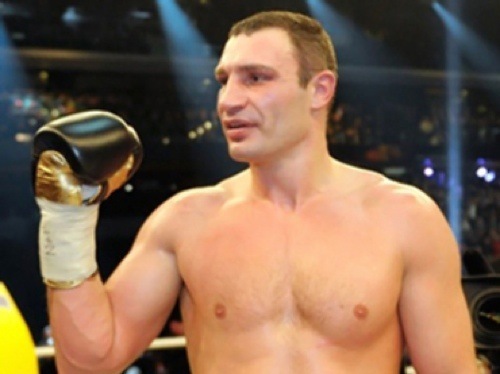 Klitschko and Udar are not expected to win by a knockout. But his party has soared in opinion polls to second place, displacing the coalition of Yulia Tymoshenko, the braided diva of the opposition. She is in jail, serving a seven-year jail term for abuse of office when she was prime minister. She charges she was jailed on orders of her political rival, President Viktor Yanukovych. Less than three years after winning election, Yanukovych has seen his approval rating dwindle to 13 percent. But his ruling Party of Regions is expected to get enough votes Sunday to form a parliamentary majority with the Communist Party of Ukraine. A divided opposition Olexiy Haran, a political scientist with Kiev Mohyla University, explains why. "It's the oppression of freedom of press," he says. "It's the pressure on independent TV channel. It's the pressure on opposition. It's bribery. It's the use of so-called administrative resources, direct interference in the campaign." University student Vyacheslav, 22, says he is going to vote for Tymoshenko's opposition party. "[I will vote for] Yulia Tymoshenko, because I don't like Yanukoych and his party, and I don't like the political situation in my country" he said. "And I hope that it will be better in the future." After years of political paralysis and an economy growing this year by only 1 percent, many Ukrainians have lost faith in politicians. Julia, 27, an office manager, says that some of her friends will vote Sunday "against all." "This year, I don't think that everyone will go for voting, because people were disappointed with our last elections." But looking ahead, many say the electoral performance of "Dr. Ironfist" on Sunday will give a clear indication of his viability in Ukraine's presidential election campaign, two years from now.